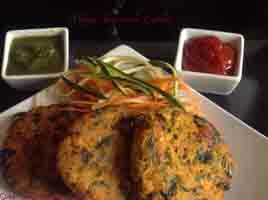 Bread Pakoras is a popular indian fried snack which is best enjoyed with a hot cup of masala chai on a rainy day ! It is crispy on the outside and bursting with hot, spicy, tangy flavours inside. I like to define bread pakoras as 2 slices of bread sandwiched with “awesomeness inside”. Today, i am bringing a new avatar of this fabulous dish which is PAN FRIED, GUILT FREE and DIABETES FRIENDLY ! This week the task on hand was to “unfry the fried food”. As interesting as it sounded, the real challenge for me was to choose what i wanted to do. Indian snacks being a Pandora box of fried treats, i had loads of options to choose from and rattle my brain to make it healthier and wise. I began thinking of all the fried foods i enjoyed munching as a kid and suddenly a very sweet memory flashed in front of my eyes. 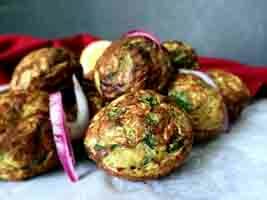 I remembered this one rainy Sunday, many many years ago, when i was helping my dad with some home repairs and mom came to ask dad what she should prepare for brunch and dad said ” Oh, some really nice, crispy bread pakoras please”. Both my parents have been very health conscious since ever, so this was very surprising to hear and was even more so when mom happily agreed to make them 🙂 I remember doing a little happy feet dance too. That day, for the first time, i stood with my mom in the kitchen, observing her, as she prepared those delicious Bread pakoras. With that memory, i decided to relive those moments and make a diabetic friendly, unfried version of bread pakoras. These Bread pakoras use Whole wheat bread and is stuffed with spicy sweet potatoes and Tofu ! Enjoy ! Take a non stick skillet and heat it up. Add in the chopped onion to the dry hot skillet and let it saute on medium high till it is well roasted. Remove from heat and place in a mixing bowl. Add in all the remaining ingredients and mix well. Stuffing 1 is ready. Mix in all the spices with the lemon juice. Pour this marination over the tofu slices and coat well. Let it rest for 10 minutes. Tofu will soak up all the marination. Stuffing 2 is ready. For Stuffing 3, follow the procedure for the mint-coriander chutney here . Mix chickpea/kala chana besan with water, turmeric and salt. The batter is ready. Heat up a non stick skillet and keep it ready for pan frying the bread pakoras. Take 1 slice of bread. Apply the mint-coriander chutney on one side. 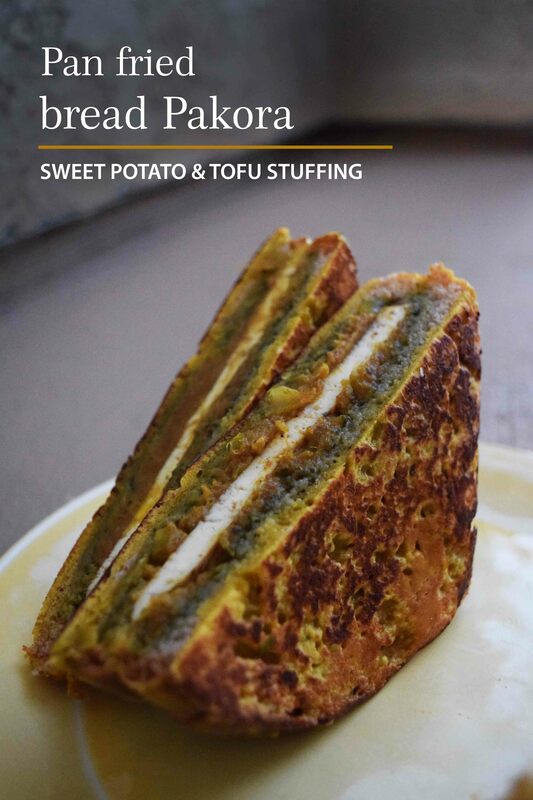 To this, add a thin layer of sweet potato stuffing followed by the marinated tofu and a second layer of sweet potato stuffing to sandwich the tofu in between. Take another slice of bread and apply mint-coriander chutney on one side. Place this slice on top of the assembled slice (with chutney facing inside). press gently. Now, apply a thin layer of chickpea batter on all sides and quickly place this on the hot skillet. 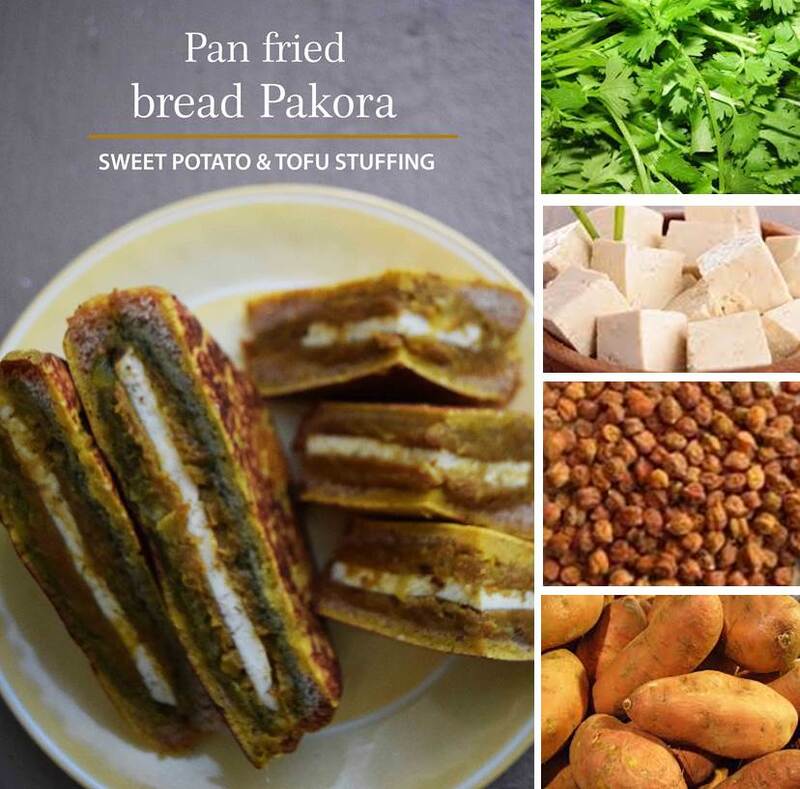 Let this cook for 15-20 seconds (till the batter firms up) and flip the bread pakora over. Apply a thin film of oil using the brush. Roast on all sides. Pan fried bread pakora is ready. 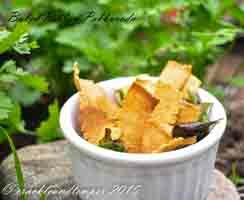 Note – You can also make these without coating them with chickpea flour/besan and pan fry them straight. Sweet Potato– Sweet potatoes are a good food choice for diabetics as they are high in fiber and have a low glycemic index of 44. Though the primary nutrient in a sweet potato is carbohydrate, they are also good sources of fiber, beta carotene (vitamin A), vitamin C, and vitamin B6 — and despite being primarily carbohydrate, some studies have shown that sweet potatoes can help stabilize blood sugar levels and lower insulin resistance. Tofu – Tofu may be especially beneficial for diabetics, because it is a complete protein that enables better regulation of sugar levels. In multiple animal studies, soy foods have been shown to lessen insulin resistance by increasing the synthesis of insulin receptors. However, this increased formation of insulin receptors only appears to occur in the presence of other dietary circumstances, like a moderate amount of polyunsaturated fat intake. Coriander/Cilantro – In parts of Europe, cilantro has traditionally been referred to as an “anti-diabetic” plant, due to its wonderful ability to help lower cholesterol and lower blood sugar levels (it packs in a whopping 521 mg of potassium per 100 grams!). Individuals suffering from diabetes have problems regulating and keeping their blood sugar stable. Consuming cilantro and keeping sodium intake to a minimum, could help eliminate this effect. Cilantro’s health benefits also go past helping lower LDL cholesterol, but can also reduce hypertension by lowering blood pressure! Each 100-g serving of raw cilantro leaves provides over 521 mg potassium and only 46 mg sodium (naturally occurring cell salts). Consuming a high-potassium, low-sodium diet may help you control your blood pressure. Kala Chana Besan – Each cup of kala chana has 45 grams of carbohydrates, which is about 65 percent of the total caloric content of the legume. Kala chana is especially rich in dietary fiber .A 1-cup serving contains 12 grams of fiber, which is 35 percent of the daily fiber requirement for a man and nearly 43 percent of the fiber recommended each day for a woman. A cup of boiled kala chana contains 269 calories. It has 4 grams of total fat, with less than 1/2 gram of cholesterol-raising saturated fat. Beans are good plant-based sources of protein, and 1 cup of kala chana contains 15 grams of protein, or 30 percent of the daily value based on a 2,000-calorie diet. Doesn’t all this sound exciting !! Try this super healthy recipe soon and let me know how was your experience 🙂 Hop onto this page for more exciting DFT recipes from Divine Spice Box ! 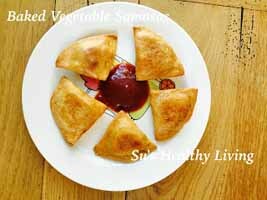 Tagged appetizer, Bread, Healthy, indian, Quick, Snack, Summer. Lovely! Such a healthy alternative to the regular deep fried one!